I spent my childhood in the English countryside over 70 years ago where we lived a simple life without telephones or electricity. Horses were still a normal source of power and we hardly imagined radio and television. One thing I remember well was how superstitious we all were and how tangible was the concept of evil. Men and women who in other ways were intelligent, fearfully avoided places said to be haunted, and they would suffer inconvenience rather than travel on Fridays that were the 13th day of the month. Their irrational fears fed on ignorance and were quite common. I cannot help thinking that they persist, but now these fears are about the products of science. This is particularly true of nuclear power plants that seem to stir the dread that in the past was felt about a moonlit graveyard thought to be infested with werewolves and vampires. 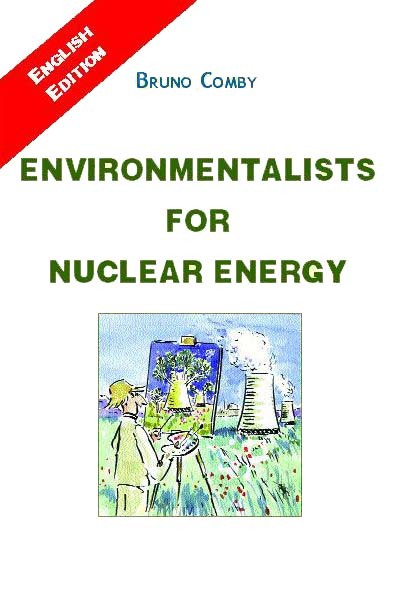 The fear of nuclear energy is understandable through its association in the mind with the horrors of nuclear warfare, but it is unjustified; nuclear power plants are not bombs. What at first was a proper concern for safety has become a near pathological anxiety and much of the blame for this goes to the news media, the television and film industries, and fiction writers. All these have used the fear of things nuclear as a reliable prop to sell their wares. They, and the political disinformers who sought to discredit the nuclear industry as potential enemies, have been so successful at frightening the public that it is now impossible in many nations to propose a new nuclear power plant. No source of power is entirely safe, even windmills are not free of fatal accidents, and Bruno Comby's fine book gives a true and balanced account of the great benefits and small risks of nuclear power. I wholeheartedly agree with him and I want to put it to you that the dangers of continuing to burn fossil fuels (oil, gas, coal) as our main energy source are far greater and they threaten not just individuals but civilization itself. Much of the first world behaves like an addicted smoker: we are so used to burning fossil fuels for our needs that we ignore their insidious long-term dangers. Polluting the atmosphere with carbon dioxide and other greenhouse gases has no immediate consequences, but continued pollution leads to climate changes whose effects are only apparent when it is almost too late for a cure. Carbon dioxide poisons the environment just as salt can poison us. No harm comes from a modest intake, but a daily diet with too much salt can cause a lethal quantity to accumulate in the body. We need to distinguish between things that are directly harmful to people, and things that harm indirectly by damaging our habitat the Earth. Bubonic plague in the Middle Ages was directly harmful, caused immense personal agony and killed thirty percent of Europeans, but it was a small threat to civilization and of no consequence for the Earth itself. The burning of carbon fuels and the conversion of natural ecosystems to farmland cause no immediate harm to people but slowly impair the Earth's capacity to self-regulate and sustain, as it has always done, a planet fit for life. Although nothing we do will destroy life on Earth, we could change the environment to a point where civilization is threatened. Sometime in this or the next century we may see this happen because of climate change and a rise in the level of the sea. If we go on burning fossil fuel at the present rate, or at an increasing rate, it is probable that all of the cities of the world now at sea level will beflooded. Try to imagine the social consequences of hundreds of millions of homeless refugees seeking dry land on which to live. In the turmoil, they may look back and wonder how humans could have been so foolish as to bring so much misery upon themselves by the thoughtless burning of carbon fuels. They may then reflect regretfully that they could have avoided their miseries by the safe benefice of nuclear energy. Nuclear power, although potentially harmful to people, is a negligible danger to the planet. Natural ecosystems can stand levels of continuous radiation that would be intolerable in a city. The land around the failed Chernobyl power station was evacuated because its high radiation intensity made it unsafe for people, but this radioactive land is now rich in wildlife, much more so than neighboring populated areas. We call the ash from nuclear power nuclear waste and worry about its safe disposal. I wonder if instead we should use it an an incorruptible guardian of the beautiful places of the Earth. Who would dare cut down a forest in which was the storage place of nuclear ash? Such is the extent of nuclear anxiety that even scientists seem to forget our planet's radioactive history. It seems almost certain that a supernova event occurred close in time and space to the origin of our solar system. A supernova is the explosion of a large star. Astrophysicists speculate that this fate may overtake stars more than three times as large as the Sun. As a star burns - by fusion - its store of hydrogen and helium, the ashes of the fire accumulate at the centre, in the form of heavier elements like silicon and iron. If this core of dead elements, which are no longer able to generate heat and pressure, should much exceed the mass of our own sun then the inexorable force of its own weight will cause its collapse in a matter of seconds to a body no larger than 18 miles (30 kilometers) in diameter but still as heavy as a star. We have here, in the death throes of a large star, all the ingredients for a vast nuclear explosion. A supernovae, at its peak, produces stupendous amounts of heat, light and hard radiations, about as much as the total produced by all the other stars in the same galaxy. Explosions are never one hundred percent efficient. When a star ends as a supernova, the nuclear explosive material, which includes uranium and plutonium, together with large amounts of iron and other burnt-out elements, scatters in space, as does the dust cloud of a hydrogen bomb test. Perhaps the strangest thing about the Earth is that it formed from lumps of fall-out from a star-sized nuclear bomb. This is why even today there is still enough uranium left in the Earth's crust to reconstitute on a minute scale the original event. There is no other credible explanation of the great quantity of unstable elements still present. The most primitive and old-fashioned Geiger counter will indicate that we stand on the fall-out of a vast ancient nuclear explosion. Within our bodies, half a million atoms, rendered unstable in that event, still erupt every minute, releasing a tiny fraction of the energy stored from that fierce fire of long ago. Life began nearly four billion years ago under conditions of radioactivity far more intense than those that trouble the minds of certain present-day environmentalists. Moreover, there was neither oxygen nor ozone in the air so that the fierce unfiltered ultra-violet radiation of the sun irradiated the surface of the Earth. We need to keep in mind the thought that these fierce energies flooded the very womb of life. I hope that it is not too late for the world to emulate France and make nuclear power our principal source of energy. There is at present no other safe, practical and economic substitute for the dangerous practice of burning carbon fuels.